When the Nebraska Legislature voted in May to ban the death penalty in the state – overriding the governor’s veto – supporters of the ban shared some of the credit with religious leaders who had spoken out on the issue, including several Catholic bishops. In fact, many large religious groups have taken positions in opposition to the death penalty even though that stance is sometimes at odds with the opinions of their adherents. The Catechism of the Catholic Church says the death penalty is acceptable if it is “the only possible way of effectively defending human lives.” In recent years, however, both the U.S. Conference of Catholic Bishops and Pope Francis have spoken firmly against capital punishment. They are not the only religious leaders to take this position; when it comes to the official teachings of large U.S. religious groups, opposition to the death penalty is more common than support for capital punishment. This is in contrast with public opinion: A majority of U.S. adults (56%) still favor the death penalty, although support has been dropping in recent years. There also is a disparity between religious groups’ positions and the views of their adherents, particularly among mainline Protestants. Two-thirds of white mainline Protestants (66%) favor the death penalty, but several of the biggest mainline churches are against it. This includes the United Methodist Church, the Evangelical Lutheran Church in America, the American Baptist Churches USA, the Presbyterian Church (U.S.A.) and many others. Roughly half of U.S. Catholics (53%) – including a majority of white Catholics (63%) – also favor the death penalty, in contrast with church leaders’ stance. The Church of Jesus Christ of Latter-day Saints (Mormon church) also does not take an official position on the death penalty. Neither does the National Baptist Convention, the largest historically black Protestant denomination, although most black Protestants (58%) oppose the death penalty (in contrast with the U.S. public overall). Indeed, there is a significant racial divide when it comes to views on the death penalty, with blacks and Latinos more likely than whites to oppose it. The National Latino Evangelical Coalition recently came out against the death penalty. 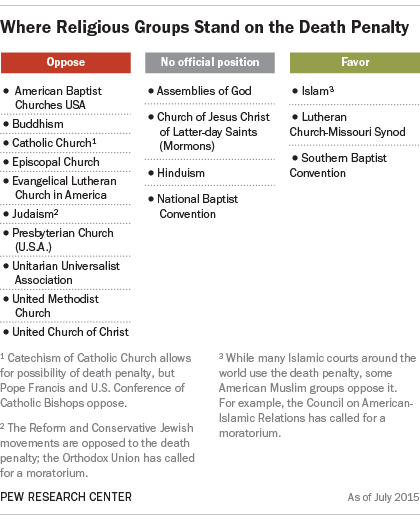 Among non-Christian faiths, teachings on the death penalty vary. The Reform and Conservative Jewish movements have advocated against the death penalty, while the Orthodox Union has called for a moratorium. Similarly, Buddhism is generally against capital punishment, although there is no official policy. Hinduism also does not have a clear stance on the issue. In Islam, the death penalty is widely seen as acceptable (based on the Quran), and Islamic courts in countries such as Saudi Arabia and Iran routinely hand down death sentences. Some U.S. Muslim groups, however, have spoken out against the death penalty; for example, the Council on American-Islamic Relations has called for a moratorium. Religiously unaffiliated Americans – atheists, agnostics and those who say their religion is “nothing in particular” – are split on the death penalty, with 48% in favor and 45% opposed.